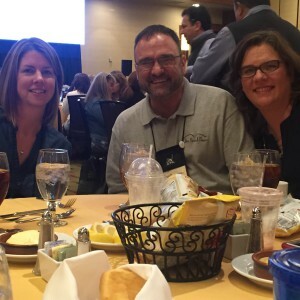 I know that Carol has briefed you on the amazing ACFW conference that happened this last weekend in Dallas, Texas. She’s shared stories and pictures and what an amazing time it is networking with other Christian authors. It truly is all that she described. All of the classes and networking and amazing meals and awards, all of that pale in my experience to the worship service. There is absolutely nothing like worshiping with 500 Christian fiction writers. Absolutely nothing. Last year, when I did my taxes, I realized I’d taken 30 trips. THIRTY. Of those, I went to romance writing conference after indie writing workshop after secular writing conference. Then, I went to Blue Ridge Christian Writers Conference in North Carolina. There, at the Lifeway Ridgecrest Center, I found my people. Writers determined to spread the word God had given them as far and as wide as they could spread it. Classes and workshops centered around a mutual desire to serve God and man. It was wonderful and beautiful. And then there was the worship. Author Rachel Hauck and a team of musicians led worship in such an amazing and beautiful way. There was NOTHING like worshiping with hundreds of other Christian authors. That was in May. 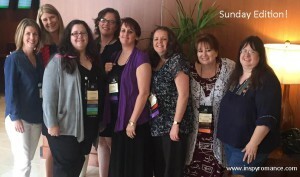 In September, I headed to St. Louis for my first ever American Christian Fiction Writers Conference. Imagine my delight in discovering Rachel Hauck and her team of musicians leading worship there, too! I cannot express to you what it did to my heart and soul to be part of that lifting of voices and hands to God. Because my daughter graduated high school this last year, and due to the nature of our school system and how they do snow days, I wasn’t able to schedule going to the Blue Ridge conference. It was scheduled right around the same time as graduation, so it was better safe than scheduling to attend and having to cancel. But all summer, I’ve looked forward to that third weekend in September and the annual ACFW conference. My husband attended with me this year. That made an amazing time even more perfect. We stayed at a different hotel from the conference hotel, and skipping the provided breakfast to dine at our hotel wasn’t even an option — because we knew that following breakfast every day, there would be worship. With hands raised in the air and lifting our voices to God, we joined the other nearly 500+ people of like minds – writers and editors and agents – people who know us and understand how our brains work and never think that the conversations we have with people of our own imagination is somehow weird – with those people and just praised the Omniscient Creator of the heavens, the Almighty Yah. And for four days this year, I was immersed in an environment with people who “get me”, who like me anyway, and who understand what it’s like to do what I do. I’ll look forward to Rachel Hauck’s worship for several more months until I’m able to get to the next major Christian Writers Conference. Hallee–I love this post. We go to a large church, about 2000 in each service and there is nothing like seeing, hearing all the people praising Jesus. 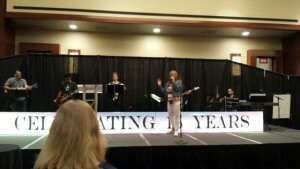 I haven’t been to ACFW in a few years, but I still remember singing the Revelation Song there–will all the people–amazing. And it is cool to hang around a lot of people who love Jesus! Thanks for sharing your experience. The Revelation Song is my all time favorite worship song. I do travel a lot. God has really blessed my endeavors. It’s a wonderful feeling to be with people who “get us.” Thanks for sharing your experience, Hallee. How nice that your husband was there with you. I’ve really enjoyed seeing all of the photos from the conference. It is. :) God is good. 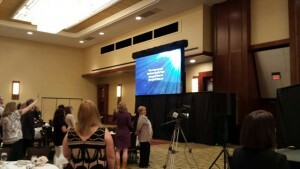 I attend a small church in a small town, and I so agree that the best moments of the ACFW conferences I’ve been to were the corporate worship. The first year I went was Denver, and the theme song was “While I’m Waiting” by John Waller. That song made such an impact on me that I now own two John Waller albums, and the memory of singing that — and many other songs of praise — have stayed with me and changed me. I have attended Women of Faith, Women of Joy and Beth Moore conferences in the past. It always gives me goosebumps when I hear the sound of so many women worshipping together. What a blessed experience. I really enjoyed the blog post. Hallee, I can’t imagine traveling that much to attend conferences. How do you get your writing done? I love Rachel’s worship. It’s all out there and so…well, words just don’t describe it. The Conference sounds so fun! Thanks for sharing! It is one I hope to never miss! Wow, I can’t even imagine worshiping with 500 or so other Christians in one mind and accord….I bet that’s almost what the day of Pentecost was like! And maybe a little taste of what’s waiting for us in Heaven :-) The church I attend is small (30 or so), but when we all worship in one heart, it’s like the floodgates open & God steps into the now to inhabits our praises….that’s a wonderful time in itself….so having HUNDREDS of worshipers….swheeeeewwwww….can’t fathom that feeling! I bet that was the highlight of the conference, not the writing or getting together with others of your profession (if I may say that loosely, lol)….after all, isn’t that what you write for to glorify the One who puts those stories on your heart? So glad you had a fantastic time & that you were able to spend it with your husband, makes it even more special I bet :-) Hope you get to attend many more conferences and have some great times of worship again soon!